There are days when you almost jump out of bed full of energy, and then there are those when you want to snuggle even deeper into the covers and never, ever leave. 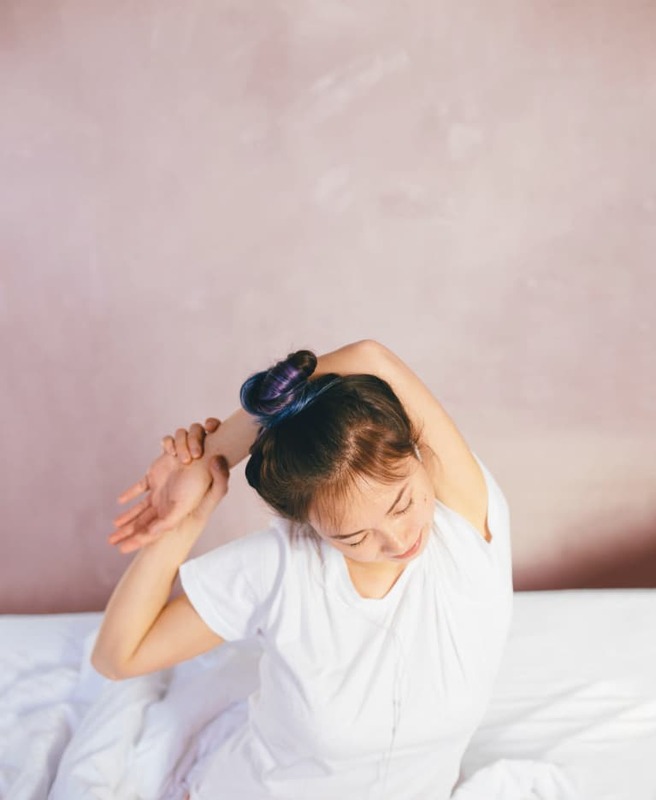 When you feel like hibernating, a few quick, simple stretches can help you feel more awake and ready to tackle the day. You can even do these three stretches while still inbed if it’s just too hard to leave the warmth of your covers. Cat/cow is a gentle stretch you can do when first waking up that warms the body and brings flexibility to the spine. Not only will it open your chest and increase your ability to breathe deeply, it can also help to relieve stress and calm your mind first thing in the morning. It’s a great one to start with, especially if you have a stressful day ahead. Begin on your hands and knees with your wrists directly under your shoulders and your knees directly under your hips. Your fingertips should be pointed forward, and your neck should be neutral. Start with cow stretch by first inhaling as you drop your belly. Lift your chin and chest as you gaze up toward the ceiling. Relax your shoulders. Next, go into cat pose by exhaling and drawing your belly toward your spine as you round your back toward the ceiling. You should feel like a cat stretching its back in this stretch. Repeat this sequence at least five to 10 times. Whether you have an office job, commute to work, work out a lot, or all of the above, your shoulders and chest muscles are most likely tight. This is a great stretch to open up chronically tight shoulders and chest muscles. It can help you breathe deeper first thing in the morning. Kneel on the ground in a child’s pose position. Keeping your arms straight, place your wrists on something higher such as a couple of stacked pillows or the side of your bed. The higher the surface, the deeper the stretch will be. Breathe as you gently push down through your shoulders to deepen the stretch. Most people do a lot of forward and backward movement in their workouts but very little twisting. This stretch really helps to open up your lower back, chest, and even glutes. I find it feels especially great first thing in the morning when your body is naturally more stiff from sleeping. Lie on your back on the floor with your arms in a “T” position by your side. Bend one leg and gently twist it to the opposite side so that your knee is touching or nearly touching the ground. Hold this position for 30 to 60 seconds as you breathe deeply into the stretch. Note: Avoid this one if you’ve had disc or lower-back injuries in the past.